Third Friday of the month, 11 a.m.
Join us at the Brunk Children’s Museum of Immigration for a story and craft time. The theme for the school year 2018-2019 will be Scandinavian children’s literature. All ages are welcome to attend with a caregiver for this free (with admission) program. While there is no additional cost to attend, reservations are appreciated and can be made via email to snyman@samac.org. First Friday of the month, 3 p.m. The Buzz Aldrin Education Cart is available for exploration. Moon Madness allow guests at the Swedish American Museum and the Brunk Children’s Museum of Immigration to enrich the experience of the Buzz Aldrin: Space Visionary exhibit. 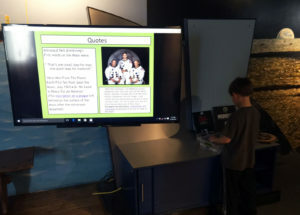 This tech-equipped mobile exhibit is used on a regular basis as part of our educational programming, as well as during select school tours. This complement to our Buzz Aldrin: Space Visionary exhibit was made possible through a grant from the Swedish Council of America. Every other Sunday, 10 a.m. – 11 p.m. Please check the calendar for dates. Taking place on alternative Sundays in tandem with Svenska Skolan, Bullerbyn is a time for singing cherished children’s songs, reading humorous tales and having lots of fun in Swedish. Children aged 6 months to 5 years are welcome to attend with parents. Only Swedish is spoken in Bullerbyn, so Swedish should be spoken regularly at home too! We meet in the gallery space or the Children’s Museum. Kids are welcome to stay and play in the Brunk Children’s Museum after the program. Classes are free for members, non-members are asked to make a $5 per child/class donation; payment can be made at the Museum. Reservations are recommended and can be made by emailing museum@samac.org. Every other Sunday, 10 a.m. – 12.45 p.m. Please check the calendar for exact dates. Svenska skolan is for children of school age (Kindergarten – High School) who speak Swedish. 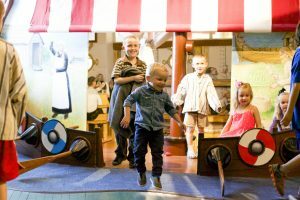 The children learn about Swedish history, geography and culture in a school setting. It is a great way for children to practice their Swedish with children their own age as well as learning more about their heritage. The 2018-2019 school year starts in September. If you want more information or to register please email Angelica afarzanehfar@samac.org. Sunday, March 23, 11 a.m.
Saturday, April 13, 11 a.m. The Museum now offers guided tours for families with children. Best suited for children aged 7 and up but all children are welcome. The tour is similar to the one offered to school groups and teaches the children and their parents about Swedish immigration to Chicago. Parents need to stay with their children at all times. The tour is free with admission. Join Pippi Longstocking, a popular Swedish character, for Swedish pancakes, crafts, singing, and dancing. 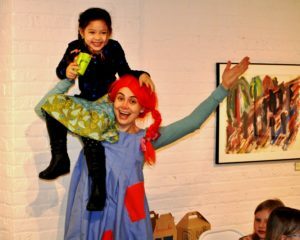 This is a unique opportunity to meet Pippi and learn how to make pancakes Pippi-style! All ages are welcome. Monday, April 15 – Friday, April 19, 11 a.m. – 3 p.m.
Join us for Easter-themed activities all week long at the Swedish American Museum. We will have fun learning about all the Swedish Easter traditions from creating Easter trees with feathers to dressing up as witches! Free with admission. Saturday, May 25, 10 a.m.
You may have heard of the Dala Horse, but did you know that there are also Dala Pigs and Dala Roosters? These are not as famous as the horse but still commonly found in homes around Sweden. You have this unique opportunity to paint your own rooster at the Museum this spring. Cost is $25 and includes everything you need to make your own Dala Rooster. Prepaid reservations are required and not refundable within 5 days of the event. Reservations can be made here. Travel the world without leaving Chicago! Come and explore the food, dance, folk arts, and cultural identities of a different country each day in our “Travel the World” summer camp. Campers end the week with their very own World’s Fair to show off their work to the public. Pioneer Camp is always packed with fun and adventure for children ages 6 to 10. Registration is now open and can be made here. This family event that aims at reminding children to enjoy and appreciate nature and outdoor life, through the eyes of the Swedish character Mulle. Participants will make an eco-friendly craft and enjoy an urban nature walk. More information closer to the date. 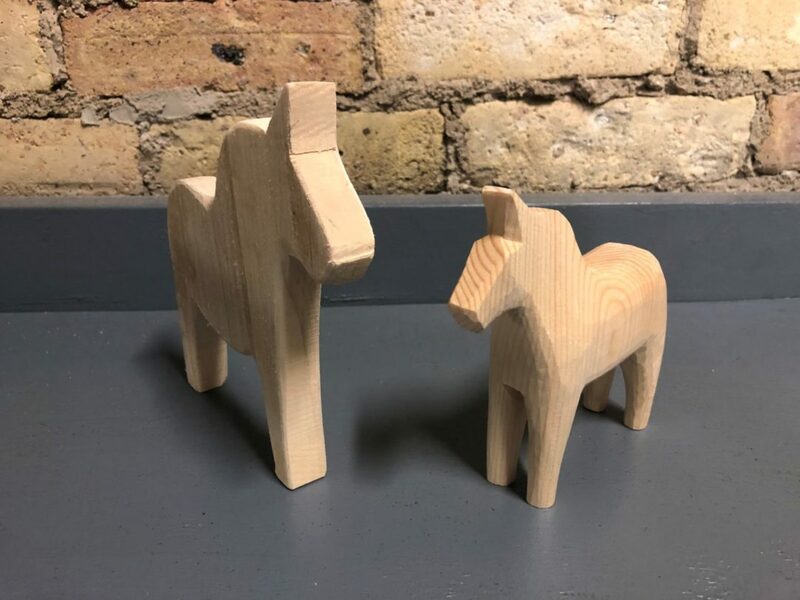 Looking for a gift for someone who has everything or just always wanted to create your own Dala horse? Here is your chance. This is an event for the whole family. You can choose to paint a real unfinished 13 cm Dala horse or a flat children’s version. More information to come later this year. Join us for our most popular family event of the year! 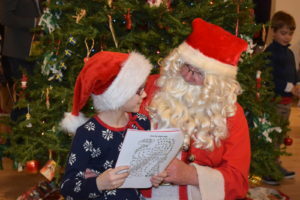 Bring the family to the Museum to enjoy a Swedish pancake breakfast with traditional crafts, dancing around the Christmas tree, and a special visit from Tomten (Swedish Santa). The morning begins at 9 a.m. with crafts for family enjoyment, and breakfast to follow at 9:30 a.m. Other activities, including visits with Tomten, will follow breakfast. This event has limited capacity and therefore tends to sell out every year by the end of November, so please make sure to purchase your tickets as soon as possible. We will send out email confirmations for each reservation, as well as a request for seating requests. 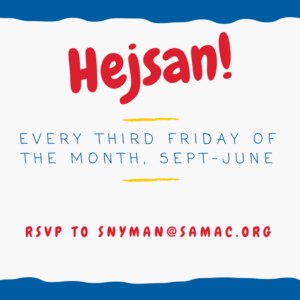 If you want to receive an email when dates have been set please email snyman@samac.org.